This weekend just gone, I went to MCM Expo in London, a convention that finds its home in the ExCeL Centre sandwiched neatly between the DLR line and the River Thames. And I went with a mission: to find any and all instances of Communism in the games area of the Expo. Why? Because it’s on-brand, of course! Here details that very quest, as well as other wonderful little aspects of my trip. I’d casually kept my eye on Agents of Mayhem since its announcement, as it seemed intriguing and fun, but what my eyes didn’t catch was what I now consider the greatest video game character of all time: Daisy, a butch roller derby girl with a rockabilly haircut and a giant minigun. Now, that’s not explicitly Communist, but a significant aspect of the kind of Communism I adhere to is women’s empowerment, and what better way to empower women than by giving them a giant gun and a penchant for aggressive roller sports? I certainly felt empowered by that design choice. The game itself feels great to play, with smooth controls and a slightly clunky but functional shooting mechanic that feels understandably reminiscent of Saints Row. 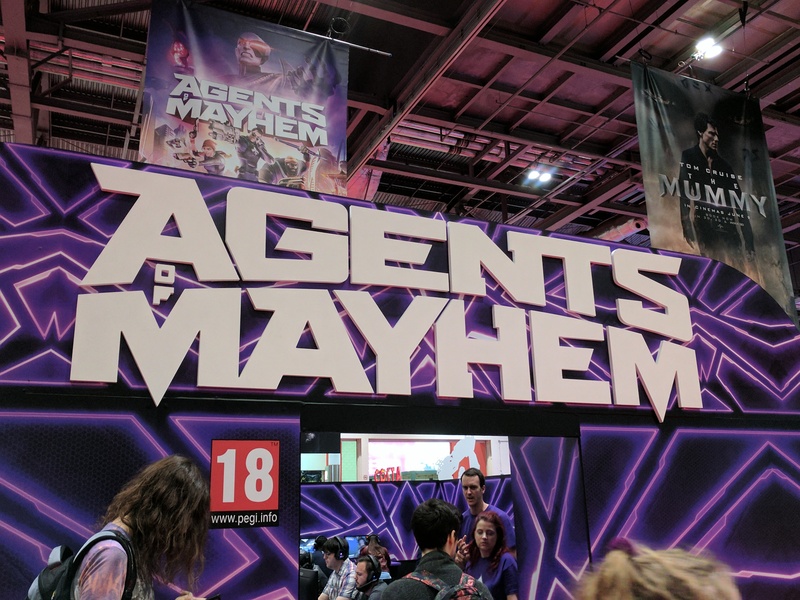 There’ll be a roster of 12 playable Agents each with unique playstyles, abilities, aesthetics and personalities, four of which were playable on the show floor: Rama, an archer and distinguished immunologist, Kingpin, the alias of 3rd Street Saints Communications Director Pierce Washington, Redcard, an unstable and bulky man with a shotgun, and the aforementioned Daisy. 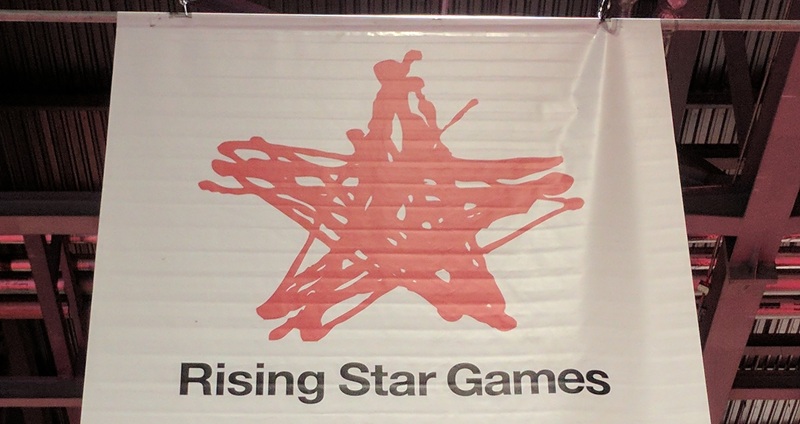 My next destination was Rising Star games. I saw the name and the logo, a red star, and assumed that this would be where I found the highest concentration of Communism at the convention. And what do you know? I picked up a 3DS loaded with a copy of Cooking Mama: Sweet Shop, a continuation of the handheld cooking mini-game franchise, and immediately understood the subtext as I began to play: Cooking Mama is about producing food for the glorious motherland. It all made sense! For years, Red Star had successfully integrated, in cleverly-sublimated messages, its belief in a glorious Communist Utopia. My evidence? The Zuccotto, which looks a bit like one of those coned roofs on the Kremlin. But oh, this was just the tip of Rising Star’s dialectic iceberg. What does this year of 2017 mark? Only the 20th Anniversary of the Harvest Moon franchise, marking the release of Red Star’s new game, Harvest Moon: The Lost Valley, yet another continuation of their glorious propaganda campaign… allow me to explain. I am convinced without a doubt, based on the theme of the game and the branding of the publisher, that the Harvest Moon franchise is indisputably a simulation of workers control over the means of production. Growing food? Cultivating crops? This combined with Cooking Mama clearly shows that Rising Star Games places a heavy importance on informing the masses of the plentiful food and produce available to all under Communism! My quest had been successful! I had found Communism at MCM Expo London. I didn’t attend the convention exclusively for this glorious purpose, of course; I adore a lot of what MCM London has to offer at their biannual events, and the con has found a special place in my heart since attending my first one in 2014. There’s the Comic Village, a sea of gorgeous artwork and nervous yet passionate faces, all dedicating their time and energy to producing compelling storylines, memorable characters, and stunning illustration. 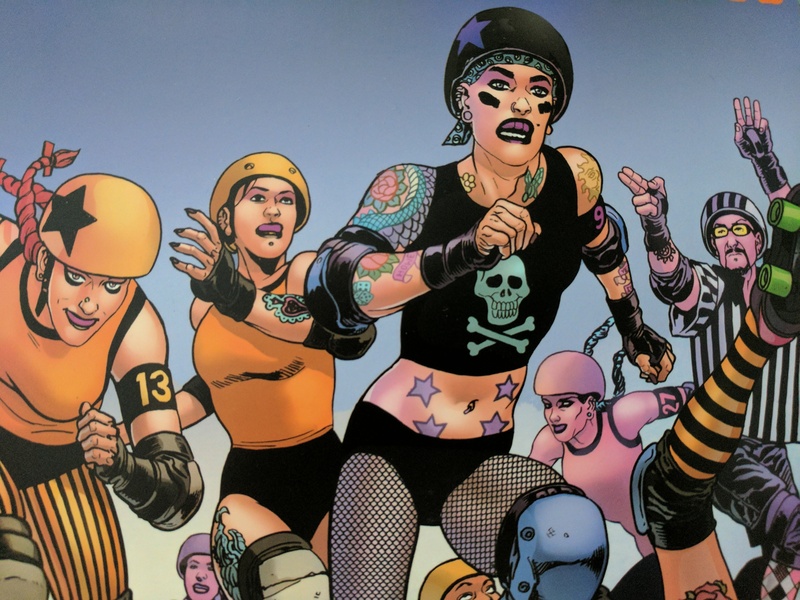 Most notably this year I purchased a concept art book for an upcoming graphic novel called Roller Grrrls, a colourful and dynamic series that looks to tell the stories of a diverse range of women participating in the sport of roller derby. There’s Discord Comics, a wonderful booth headed by Tab Kimpton, a queer comic author responsible for Minority Monsters, Shades of A, and Sir, Butler and Boy, as well as many other inclusive and representative comics celebrating the queer community and all its diversity. Tab is a lovely person, and Discord Comics’ presence at MCM Expo makes the whole convention feel that bit more accepting and comfortable an environment to exist in. And then there’s the Cosplay community, joining fans of Star Trek, Star Wars, Steven Universe, Undertale, Attack on Titan, Fullmetal Alchemist, Marvel, DC, 2000 AD, and countless other universes and franchises under one big umbrella of nerds who love to dress up as their favourite characters. It’s a community that constantly surprises me with its passion, its dedication, and its inclusivity, and a significant part of the appeal of every MCM is seeing what wonderful costumes, suits, and outfits are rolled out on the show floor. This weekend has to be one of the best I’ve had in a long time. I saw beloved friends, enjoyed my favourite creators, and even found a little bit of Communism along the way.